CHF (pink) took that session +2.05%. GBP (blue) lost that session -2.72%. 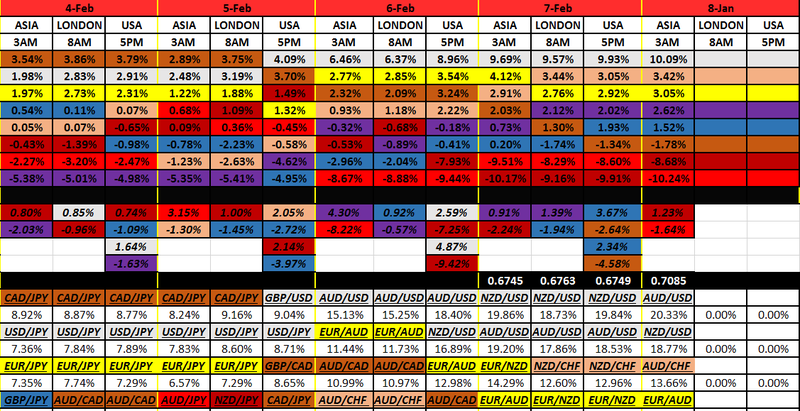 NZD (dark red) most bought currency today in total +2.14%. GBP most sold currency today in total -3.97%. Negative aggregate flow that session -6.36%. CAD/CHF top spread pair 44.40%. At .7617. I kind of think the Pound (blue) is on the slippery slope. 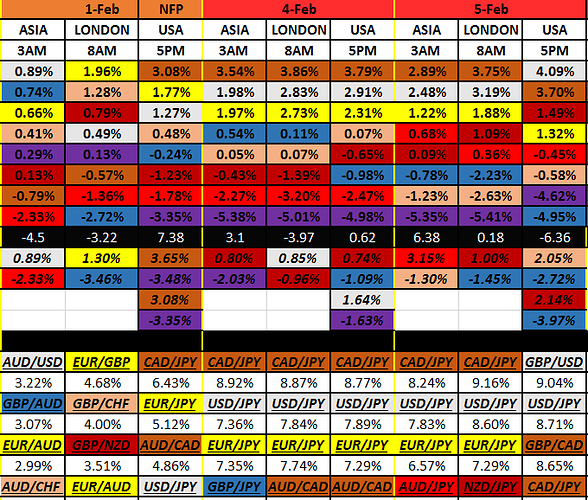 And that would be a total of 3 sessions of the 6 that we had so far this week, that they were the most sold currency. As compared to all of the others. As I was checking all these in the last hour before time was up, I’m seeing a possible change pair to trade. It’s no secret. Take a look at the GBP/NZD. What I see is a change in line up. You can just look at their chart. Probably should be something good going on in there, huh? Well, I wrote this stuff down for myself. Sometime this week I’m considering it. I need to see the week in total. At least have a good sense of where things are going. It’s a little early for me just now. Wednesday and Thursday are usually good moving days. Heck, even Friday’s are. We’ll see. I wanted to show you one more thing. My monthly table. This is a different context than the yearly/quarterly table. Well, you can’t tell me money is not wanting the USD (white). For the month, they are the most bought currency. And you can see by how much. Well, there’s a lot going on in that context (monthly all by itself). I don’t know. What other data do you need? I know. Charts, right? Support, resistance levels. Trend lines. Fibs. I understand. But, I’m sorry. I like to know what’s the aggregate money flow, first. JPY (purple) took the session +4.30%. AUD (red) lost the session -8.22%. I don’t have time now. Running late. All I have to say is, this is a game changer. Many changes. Things turned upside down. No longer risk-on. Look at the monthly table. That should tell you who’s most in demand. And who’s the most sold currencies. Let’s see mid week roll out. GBP (blue) took that session +.92%. JPY (purple) lost that session -.57%. Looks like the market doesn’t take leave. What happened, you ask? I think it had to do with Trump and the state of the union speech. This is what happened. 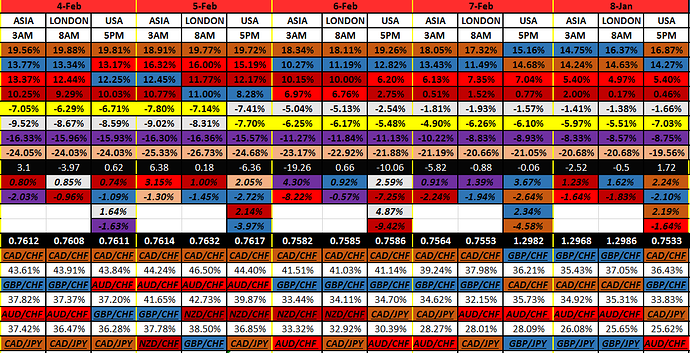 All of the major currencies (USD (white), EUR (yellow), GBP (blue), CHF (pink), JPY (purple) ) got a serious boost. And they were sitting mostly on the bottom, except the GBP. And the Comms, the rest, got sold off big time. 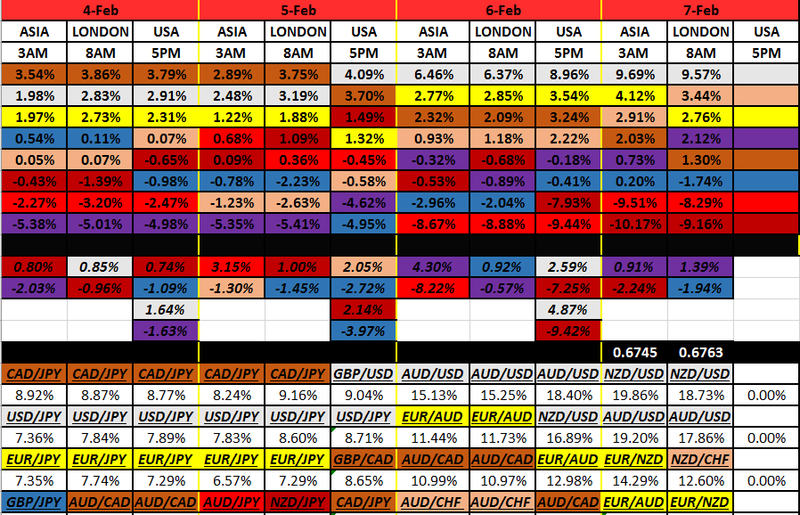 Leading the way was the AUD (red). Seriously, being sold off -8.22% in one session is quite major. You don’t see that much ever. This tells me that the party is over. What party you ask? The one that has been dominating this entire year so far. A little over a month now, this has been building. I mean, how many times have I mentioned of no real changes? And the Comms have the reins? Like, very much, everyday. But, when I think of this now, this could mean that it was nothing but a good blowing off of steam. In other words, a big retracement. A lot of profit taking. Well, in my mind, this was a statement. And I don’t want to assume that this will change the entire market sentiment. But, what will give me some clues, is waiting out the rest of the week for a judgement. We need more time to pass. Know what I mean? Look. This is how new trends start. Fundamentally speaking, starting with an economic or political bomb, like we just had. On the other hand, the market is known for irrational, and a rush to judgement, sentiment. In the short term. See how that during this second session that it didn’t really continue? It kind of leveled out. What we really need to see now is what America thinks. They need their chance to either accept what they see in the market, or buck the trend. We need a little more time. But, surely, by the end of the week, we should know better whether the market likes this new direction or not. Here’s the month, by itself, numbers. You have to see that the reddish colored Comms are not dominating anymore. 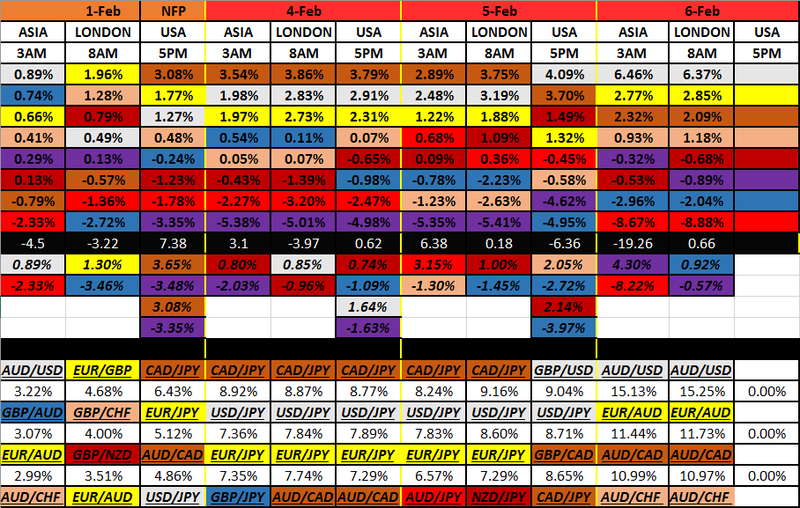 And just maybe the JPY is coming up to join the rest of the Majors. Those really are the big players. Alright. Take it for what it is. I’m waiting it out for a least a few sessions, before I decide on a trade. Btw…took a loss with the EUR/USD (stop loss hit). Oh well. I just might switch over to the monthly chart and go with the top trade there. We’ll see. And our job, in order to make any kind of money, is to find the inconsistencies that arise in the market. You exploit that for a profit. This is what you do actually. Sorry, attempt to do. When you try to look for a market edge, basically it means you want to get an information which others still have no access to. It’s all about information asymmetry right, if we talk about true market edge? Or asymmetry in the speed of action. So well you say that today “all majors are red, AUD is green”. Where is your informational edge if you process past, publicly available information which can be processed by algos thousands time faster than you write this post or even make a conclusion? Oh, yes, probably you apply your brilliant analytical skills, which is not available for machines. And next brilliant conjecture is that getting a print of past balanced market state gives you information about future changes in supply&demand of particular currency. If it’s possible those who have speed edge has already included this in the price, the inconsistency you mentioned. The worst thing out of there that people here can use your post to make bets, and lose. Here’s the rest of the carnage, for a Wednesday. 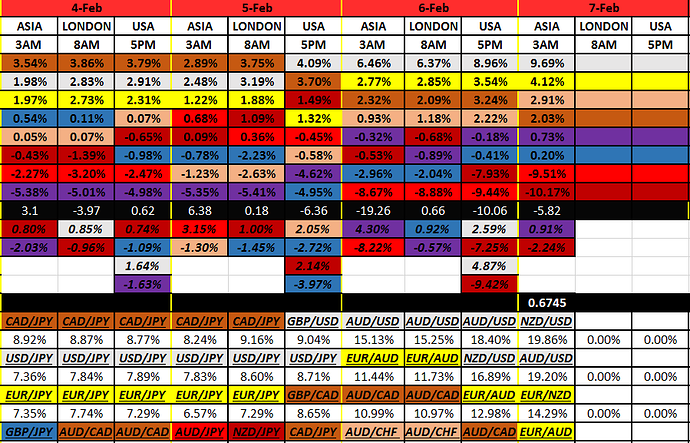 USD (white) most bid currency their session +2.59%. 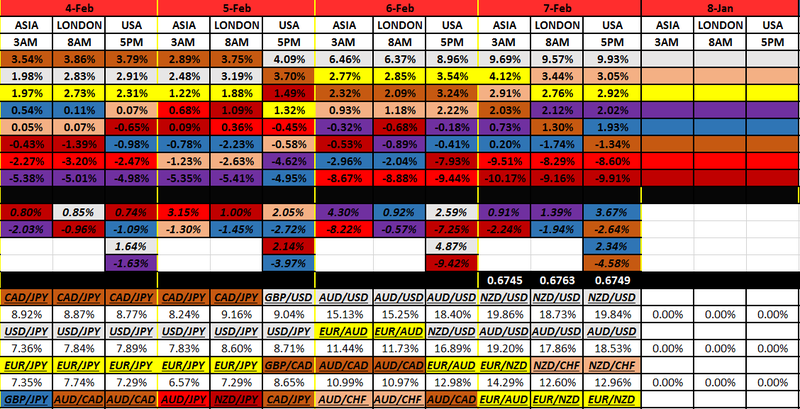 NZD (dard red) most sold currency that session -7.25%. USD took the day in total +4.87%. 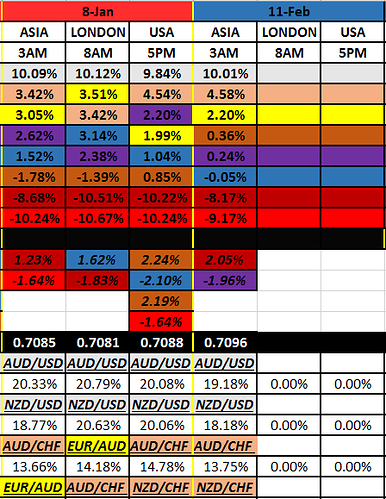 NZD lost the day in total -9.42%. Again with the massive negative flow -10.06%. AUD/USD the top spread pair +18.40%. You should realize that this is the monthly running chart. They all started the same at the open of the month. Let me put this into some perspective, for what happened today. Those are the majors. The rest is the Comms. The Comms total loss was -18.87%. And there only 3 of them. Yep. Today was a game changer. The market moved. Every session agreed. It’s cut and dry. But, regarding the CAD (brown), they are tricky. Cause they like to tail the USD sometimes. And of course they follow the oil commodity. So, I don’t know where they plan on going ( Mr. Obvious here). They were about break even today (-.46%). So, let’s see how the rest of the week goes. Here’s how Thursday is looking so far. JPY (purple) took the session +.91%. 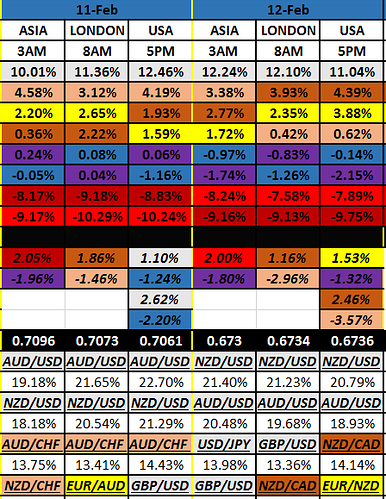 NZD (dark red) lost the session -2.24%. The month rolling out is taking shape. And looks like the CAD (brown) is coming down with the other 2. But again, they haven’t had their turn yet. We’ll see. And now what, we have another top spread pair. NZD/USD. It’s hard to tell who wants to be the most selling currency, between them two. See ya little later on. Here’s a little more market summary for a Thursday. JPY (purple) took that session, again, +1.39%. GBP (blue) lost the session -1.94%. 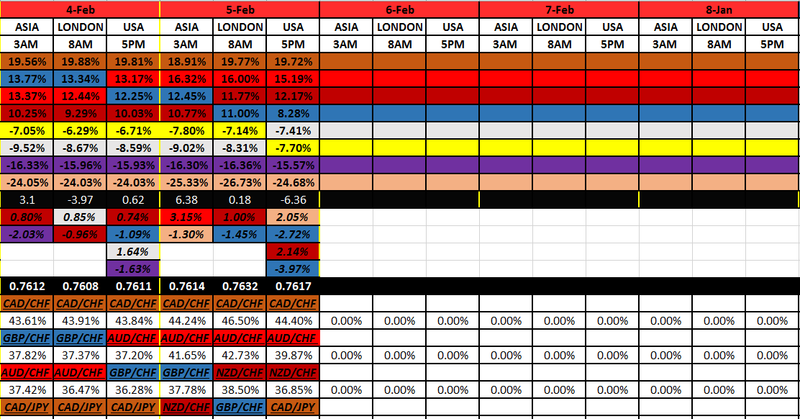 Other than the Yen taking it by the horns, what I find interesting is how the CHF (pink) is bidding. Yeah, we can say that the safe haven flows are flowing. A little bit here, a little bit there. We do have 3 possible safe haven flows. 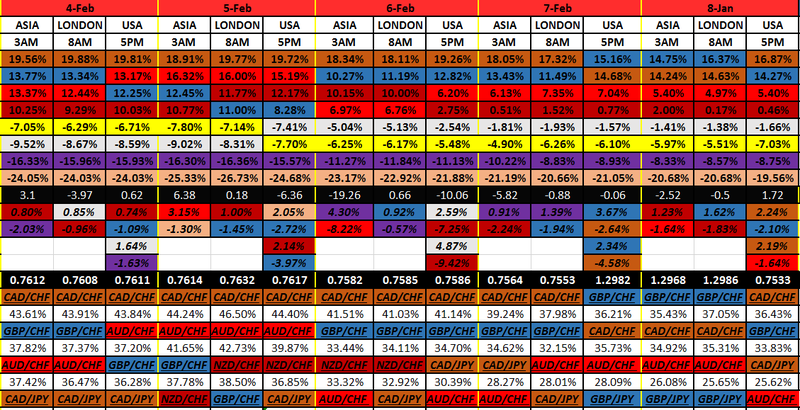 USD (white), JPY (purple), CHF (pink). And looks like all three are getting their share of it. And I still see the CAD (brown) taking a hit. 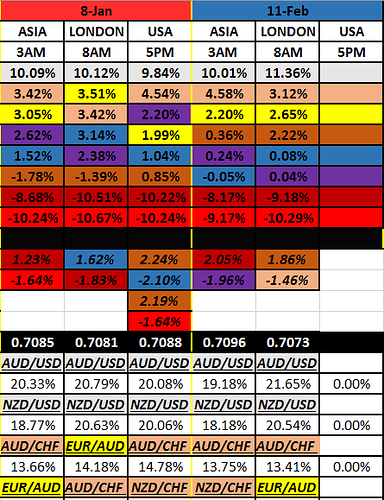 Maybe they will come down and join the other 2 (red, dark red), (AUD,NZD). Looks like it, huh? And man, the GBP (blue), boy, their back to losing again. Up and down. But, I would have to say, aggregately speaking, they have more down sessions, days, than good. 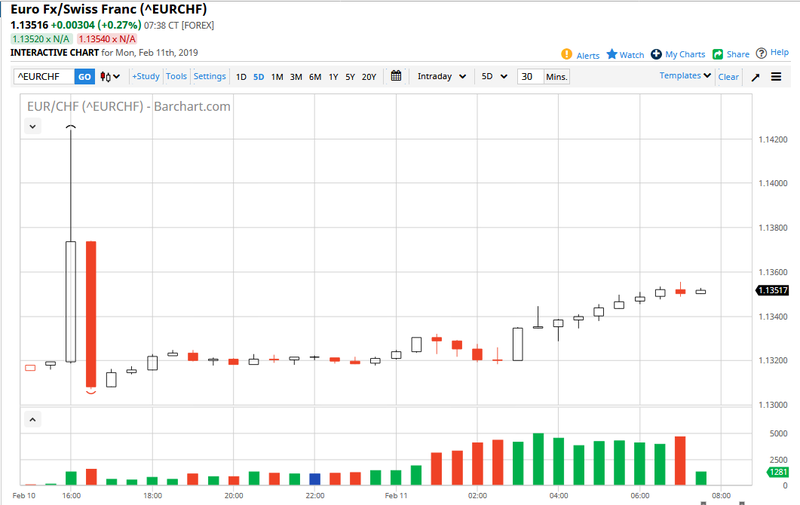 Well, the biggest thing that’s catching my attention is, because of the latest history, the CHF catching a bid. I guess it’s a nice change since they were nothing but a sell since the beginning of the year. And what effect is that having on the EUR (yellow)? Well, I think it’s too early to tell, right now, because this risk-off is the only thing causing the Swiss to climb. But, I think, just maybe this might bring up the EUR in the foreseeable future. Like, according to that chart, will keep them in the positives. Make your own conclusions. We’ll just have to see how long the risk-off scenario takes. But the way I look at it is, this is what’s happening now, and until it changes, this is what it is. Something stays constant until it changes. Remember this. The market, in essence, is only humans. It’s the decisions coming from humans. Moreso, it’s the means by which people are expressing the future. As opposed to something that isn’t human (like a digital entity). I prefer to pair the currencies with the most current price risk and the least current price risk and hold broad exposure in a hedge. Lately I prefer the USD short, I had preferred the GBP short too - until the position paid. On the other hand I prefer the AUD for long exposure. Here’s the first 4 days. GBP (blue) took that session +3.67%. CAD (brown) lost that session -2.64%. GBP most bid currency today +2.34%. CAD most sold off currency today -4.58%. NZD/USD top spread pair 19.84%. Sitting at .6749 now. Ok. Au…thanks for stopping in. Well, let’s look at your stuff. You prefer the USD short. Ok. Well, this month so far they are most bought currency. Sitting presently at +9.93%. 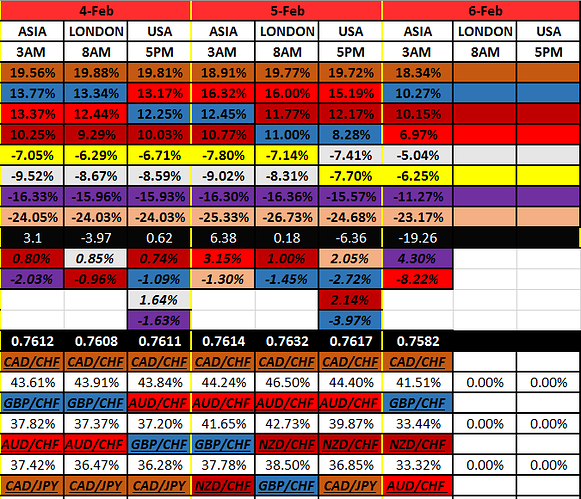 And the very next currency being bought is the CHF (pink) at +3.05%. And in the context of the year, sure, the USD is sitting at -1.57% right now. The USD is white. That table is the running totals since the first of the year. So…all you have to do is look at it. They’ve been climbing, from around -9% up to almost break even now. shrug Maybe you know something I don’t. Sure, they say that the US is heading for a recession soon, like either late this year or definitely by next year. So, hang on to them for a while. Look. I just want you to see some context of the USD. That’s all. The GBP (blue) has been a bid since the beginning of the year. Yeah, their up or down. But, I would agree with you on the short, due to the Brexit not looking so good. And how about the AUD (red)? Well, they’ve just been hit with a bomb shell a couple days ago. I don’t know if they have it in them for long. But, the Commodity Currencies are having a good year so far. We’ll have to see if this dip will last or not. Alright. I’m just trying to give you some context of how your horses are riding, in relation to the others. That’s all. I just placed 2 trades. The NZD/USD short. Due to, on the monthly table above, their the top spread pair. 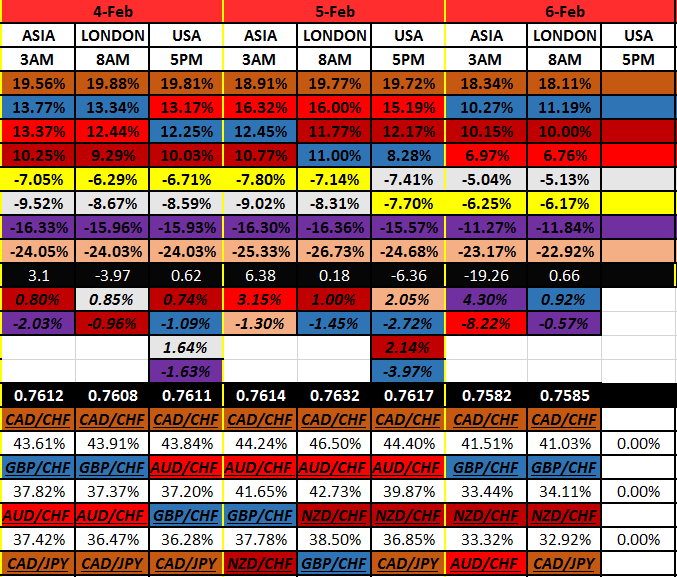 And I have the CAD/CHF short. Playing both the flip on the monthly and the polar opposite change on the quarterly table. Anyway. I know, that’s nice. Alright. Got to run. Have a good night. Here’s how Friday is unfolding so far. NZD (dark red) the most bid currency that session +1.23%. AUD (red) the most sold currency that session -1.64%. A bit of negative flow -2.52%. On the quarterly chart (not shown). Ok. Well, this is a switch. 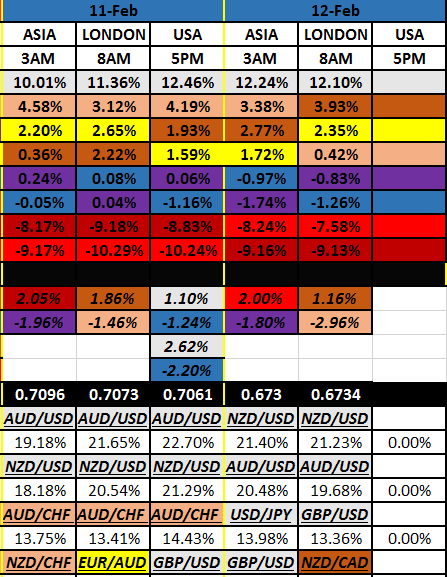 Don’t ever think I’ve seen this, in which the AUD and NZD are on complete opposite ends. Interesting. Now, that’s hard to tell whether it favors risk-on or risk-off. Have to look at the others. There’s really not much in the way of change. Although those 2 are fighting in out for last place. But, we really need more info on the day, right? See ya a little later on. Here’s a little more of Friday. GBP (blue) most bid currency that session +1.62%. 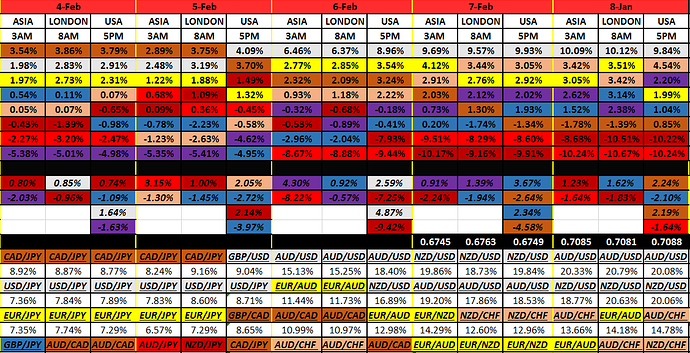 NZD (dark red) most sold currency that session -1.83%. Ok. Well, since last time (only like 5 hours ago) the NZD settled it. They dropped down like the AUD did last session. It’s kind of crazy how one currency can go from the most bid currency one session to the most sold currency the very next session, huh? I don’t know…I’m just the messenger. All I do is state the facts. Let’s see, what else interesting. I see the EUR got a bid. That makes sense to me, given their brother are finally holding hands again. And the move is up, rather than down. See how the relations between the currencies are? I just find that things in the market will make more sense, than not, make more sense. If it was more random, you couldn’t be seeing stuff like this on a regular basis. Well, I’m waiting to see what the CAD is going to do…like very shortly. Like right now. So…got to run. Very good Mike. My outlook short the USD is extendable because the risk is on the downside. The upside risk is only a minor deviation from current prices as far as I can imagine. Another week under our belts. Let’s look at it. CAD (brown) took the session +2.24%. GBP (blue) lost that session -2.10%. AUD/USD top spread pair +20.08%. At .7088 now. Yep. There’s no wonder why the CAD took it (good showing for their unemployment stat) . As I left you last, I got hit with a huge hourly candlestick (I’m short CAD/CHF). But, it did not even touch my stop loss. Another 20 or so pips and it would’ve been over. But nope. I hung in there. Following the plan. Good thing, cause the CHF is growing legs. They are the second most bought currency, for this month. The CAD high didn’t last too long, came back down to where it started before the blast off. Oh, one more thing. I am in with the NZD/USD south. Get ready next week, some major news for both of those guys on Monday, and again on Tuesday. That pair is gonna take off, somewhere. I just hope it’s with the trend. Well, on that table, you have to see that the Majors are taking the bull by the horns. And the Comms are on the other end of it. How about a summary on the, we’ll call it, the quarterly table. For the positives (4), we definitely have a wavering going on. Just look since the beginning of the week. And I don’t know what to think about the GBP (blue). But, you have to admit, for the week in total, they are more bid than a sell. For the CAD (brown), I think today was their last stand. Cause, after that awesome news, they didn’t follow through. That tells me something. For the negatives (4), we definitely have a coming up off the bottom. Well, except for the yellow one (EUR). You have to keep this in the context. The extreme %'s shown have been so high that it takes time for them to come back down. And that’s why on the monthly table it gives a more of a shorter term perspective. And, I believe, a sentiment change. You know…new month, new direction. Well, it shows, doesn’t it? Ok. That’s all good and nice. It’s the weekend. No more market. It’s all about family, friends, and a good book. NZD (dark red) the most bought currency since the open +2.05%. JPY (purple) the most sold currency since open -1.96%. So, it looks like some risk-on happening. And I think Asia is all awake now and back to work (they were off last week). Predominantly China I think. Anyway. All we can do is monitor how the day proceeds. Here’s a little more Monday market. CAD (brown) most bid currency that session +1.86%. CHF (pink) most sold currency -1.46%. Well, I’m not proud. I’ll show you the quarterly context. Yep. I’m still in the CAD/CHF short trade. It’s my change trade. I’m going to give it one more session. If the CAD stays above +16.87% (last weeks closing), I’m out. 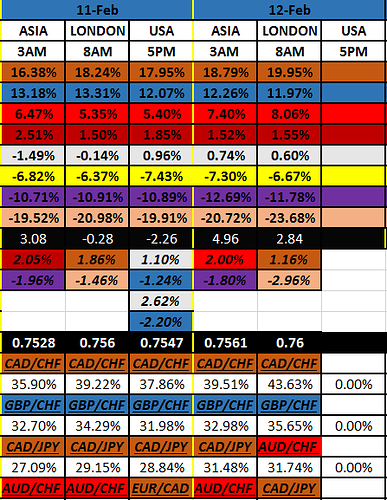 Also if the CHF goes any lower than -19.56%, I’m out. I just have to see this through. Cause my premise is that this pair is overbought. Like since the beginning of the year. See, I’m not going to play this back and forth game (a.k.a intraday swings). I need to see end of day. Ok. That’s nice. I know. You know…boy…I’ve been bothered about what happened at the open. Man! All I know is something went down, and I would very much like to know. And what’s making it really bad is that I can’t get onto my NetDania sight, for a good aggregate look. Anyway. I’ll do my best to show you. 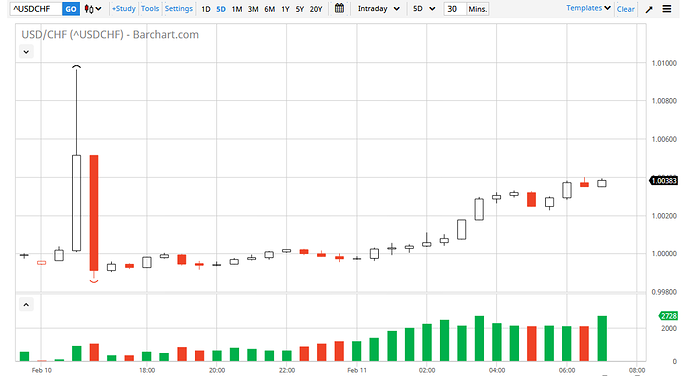 That’s the 30 min chart, since the open. So, I’ve been trying to see what currency is the culprit. I’m thinking it’s the CHF. Sold off??? That would pair a risk currency to a safe haven currency. This is the USD/CHF 30min chart, since the open. That would confirm that notion, right? But also you have this chart. 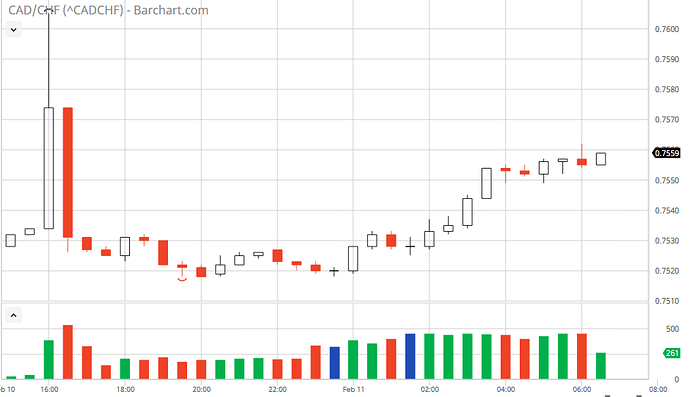 The CHF/JPY 30min chart, since the open. This is pairing both safe haven currencies. 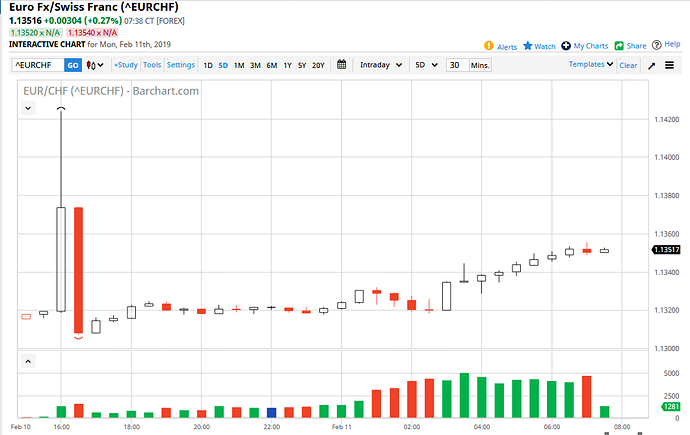 Well, it’s no secret that we are talking about a move strictly based on the CHF, rather than a risk-on, or risk-off sentiment move. Right? Ok. Well, let’s see what the EUR/CHF did. We’re talking about a 100 pip move. Then on back to where it started. But lately moving back on up there. Well, you can’t tell me something is up. I just don’t know if this is a tell of the future or not. Like…is the Swiss central bank making a statement? I’ve told you this before, they simply don’t like a strong currency. So maybe they made this move to continue the trend, from the beginning of the year. That would surely nullify the 'ol overbought/underbought indicator. Know what I mean? I think this is a clue. And you should know what I’m thinking. I need to jump! Ok. Maybe I should. And forget about my strategy premise. I’ll just throw it away. Sure, I thought about that. My stop loss is in place. That’s all there is to it. It’s laying at .7570. And wouldn’t it figure, it’s at the 200 ma. On the 1 hour chart. And also stratelling the 200 on the Daily chart, presently. Well, sorry about all that nonsense. We’re gonna have to see how the day ends. But, more whole entire point here is that I need to stick with my parameters, reasons, playbook, than anything else. You know…it’s the hard things that we have to do, no matter what. Boy…I sure would like to know the reason behind that move though. Alright. I’m done talking nonsense. See ya at the close. USD (white) most bid currency their session +1.10%. GBP (blue) most sold currency -1.24%. USD took the day in total being +2.62%. GBP most sold currency total -2.20%. AUD/USD still the highest spread pair 22.70%. At .7061. Ok. So. Since the open, we do have some changes. JPY (purple) fell to just about break even. CAD (brown) climbed up there. GBP (blue) dropped into the negatives. The USD (white) and the CHF (pink) holding up the high end of it. For the month. The AUD (red) and the NZD (dark red) holding up the low end of it. For the month. And…I’m out of that rat race. Like I mentioned on the last post. But, still in with the NZD/USD, going south. Here’s how Tuesday is shaping up so far. AUD (red) most bid currency since the open +2.0%. JPY (purple) most sold currency -1.80%. And that would surely look like some risk-on. If there’s any pair that boil risk-on/risk-off, it’s the AUD/JPY. But, I find it interesting, again, of how the NZD (dark red) dropped instead of rose, like their brother. Surely I’m not complaining. The CAD (brown) seems to be bidding also, so far today. Let me throw out the quarterly table. It’s another context. In which I think is pertinent. Well, just look at the ends. The top three rose up further. Likewise with the bottom 2, down. 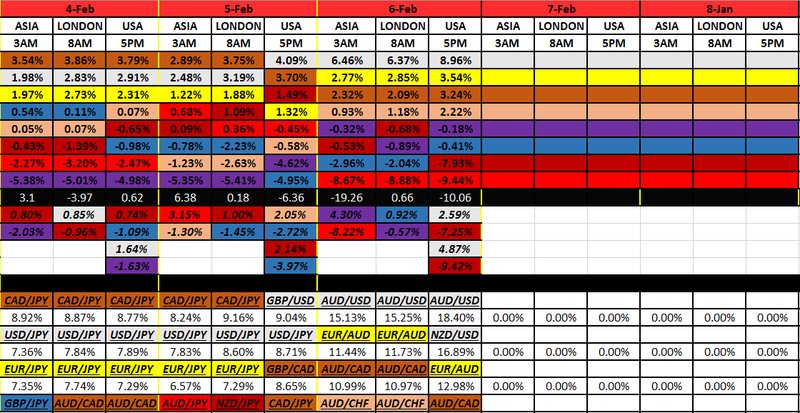 But, I would have to say that the USD (white) is above water, for the first time this year (moreso). That would mean that the USD is up .74% against all of the others combined, since the beginning of the year. Those %'s are from the year start. Let’s proceed with the day. 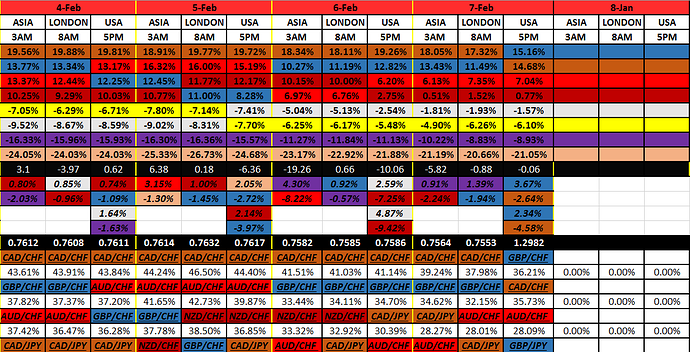 CAD (brown) most bid currency that session +1.16%. 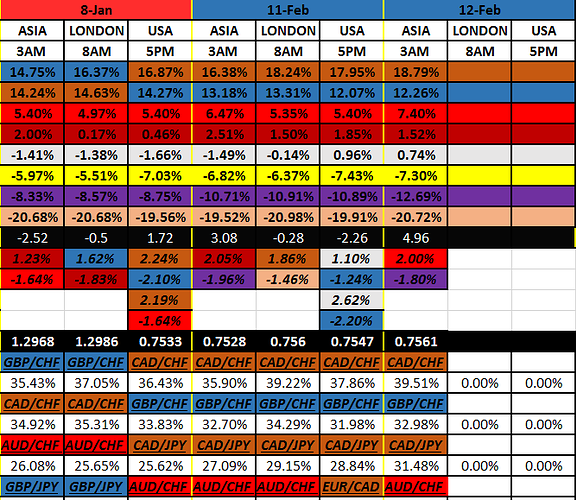 CHF (pink) most sold currency that session -2.96%. Interesting that this session was a carbon copy of yesterday’s session. The market, at this time, is wanting a higher CAD and a lower CHF. Which makes sense in the context of the running yearly totals. Look. You can’t tell me that this isn’t true, that the most bid currency for the year running is the CAD. And likewise the most sold currency for the year running is the CHF. Let’s talk about my favorite word. I’m going to drill it down into the daily perspective. So…in regards to today. What’s the most bid currency? Since the open? There it is. The AUD (red). 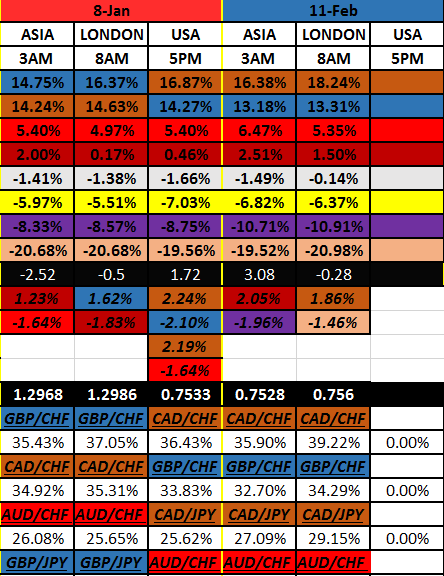 But, I find it interesting that the +.83% against the CHF is quite high for it only being at the half way point in the day. That tells me there is some real good demand, for the AUD. 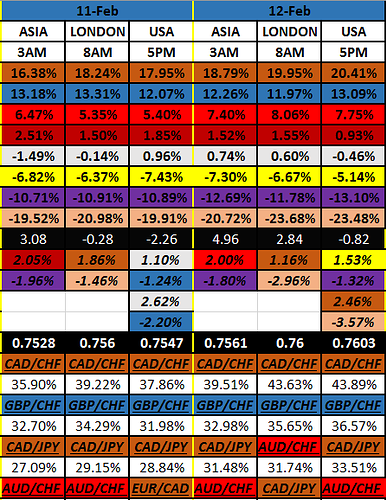 But also for some real good selling for the CHF. There’s so much we can derive from that tally. Look at the CAD (brown). 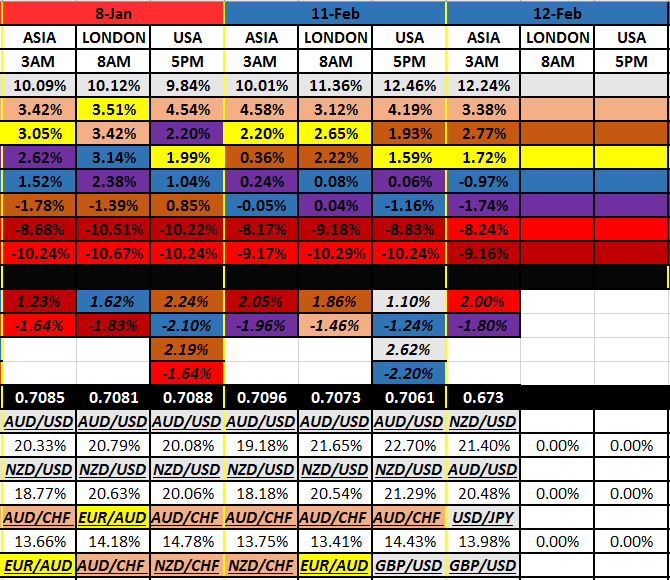 Being against the most bid currency at +.11%, they are not all that far under the AUD. Also, compare their brother with them (NZD). Look. They are +.37% higher. That’s quite a bit. I think. Looks like a good divergence to me (normally when risk-on takes place, that pair won’t be all that much separated). Ok. How about the most sold currency, for today only. You know it…the Swiss. Now, what does the field look like paired against the most sold? 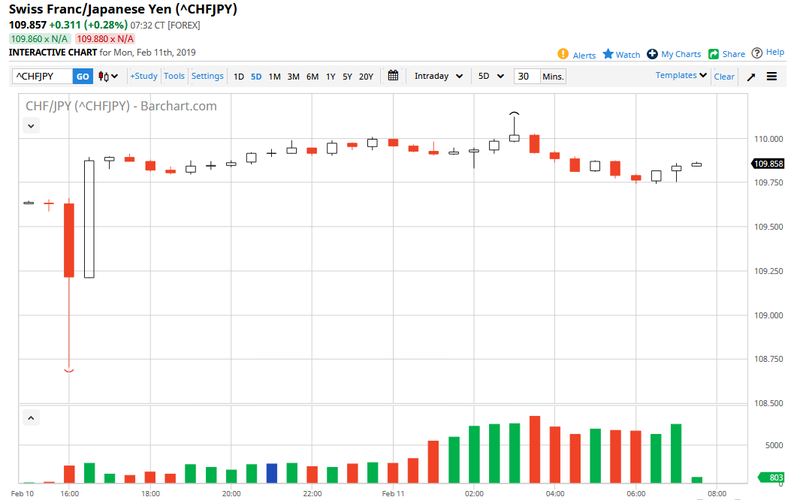 I see that the JPY (purple) is the next sold currency. Makes sense, right? They are both the safe havens currencies. But, even so, that -.35% is quite high. Therefore, that tells me that there is some serious pressure solely on the Swiss, as opposed to strickly risk-off, across the board. It’s a divergence thing. Just like between the AUD, and the NZD. So, you kind of have to see that what’s happening is not a broad based sentiment as opposed to the particular pouncing upon the individuals, which we have now. Well, it wouldn’t be fair to not include the USD. What’s the field looking like against them? I see that the Swiss selling is more than the AUD buying. Got that? I see that because the +.44% is slightly higher than the +.42%. Yeah, kind of minimal, but noteworthy. What else? Oh…compare the AUD, and the NZD, to the Dollar. That’s a divergence, to me. The AUD is up .42% to the Dollar and the NZD is only up .04%. Frankly, the reason I think the NZD is struggling lately is maybe because they have an interest rate decision coming later on after the close today. And let me remind you of what happened last week, when the AUD had their turn, with the decision. What happened? Basically, it was bad news for the AUD. That’s why we had a game changer, remember? I spoke of that. That was Wednesday after the first session ended. Man…I think this might hold true sometime as this week progresses. I really don’t know for sure. I’m just keeping it in mind. That’s all. We’ll have to see how the NZD talks about their decision and their outlook. Don’t worry, I’ll mention it when the time comes. I had enough market talk. BTW…if anybody has something else interesting, don’t be afraid to pipe in. Here’s the market after 2 days this week so far. EUR (yellow) most bid currency that session +1.53%. 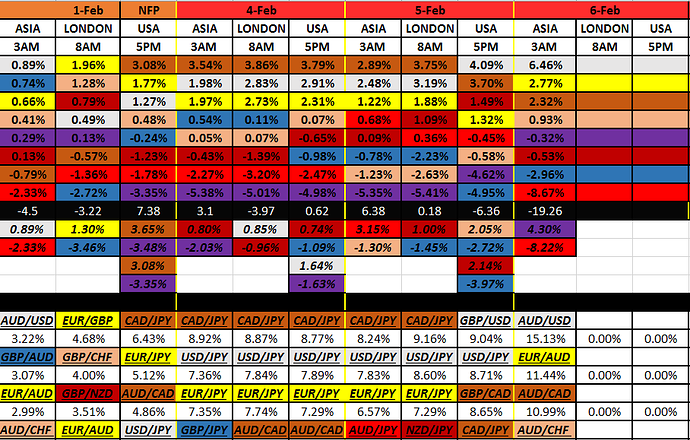 JPY (purple) most sold currency that session -1.32%. CAD (brown) most bid currency today in total +2.46%. CHF (pink) most sold currency today in total -3.57%. 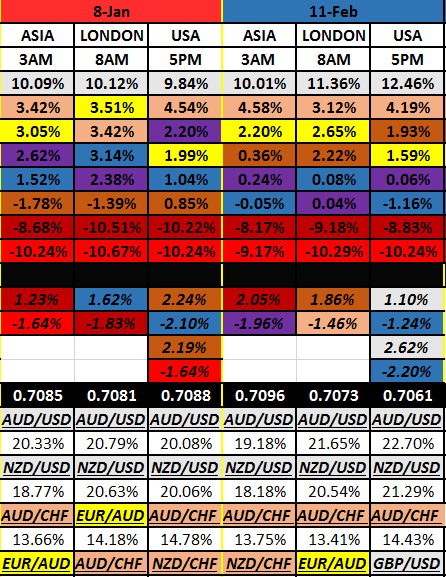 NZD/USD has the largest spread between their running totals being 20.79%. Sitting now at .6736. Well, it should be of no surprise, especially if you’ve been following along today. The CAD took the second most bid currency for the month. And the CHF continuing to be devalued. That’s been a long time running theme, huh? Let’s see it in the quarterly table. Yep. That’s nice. I know. Alright. Let the fireworks begin ( in only a couple hours from now). I will explain how it all shakes out.